Have you seen this gent? I’ve been having trouble finding Joachim (subway singer/chanter/informer of The Good News) lately. 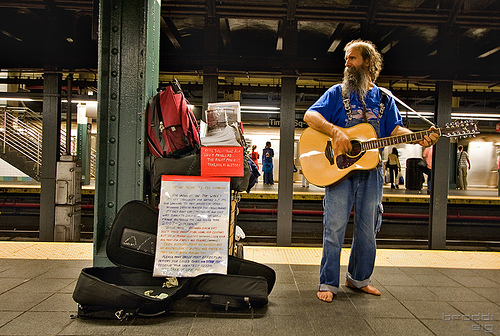 I used to see him playing around the Times Square subway stop whenever I had the unfortunate displeasure of going around those parts (or going specifically to pick up the latest Chick Tract comic of hate). I emailed The Saw Lady, as she used to run into him now and again, but she hasn’t seen him since she stopped playing around that particular hub of the universe. So, if you’ve caught a glimpse of the man without shoes, do let me know.